...but first! I would like to share two cards with you: the first one I've created specifically for this birthday celebration. The second one I made back in January for my boyfriend's birthday, but haven't shared yet. I thought now would be the perfect time to do so! 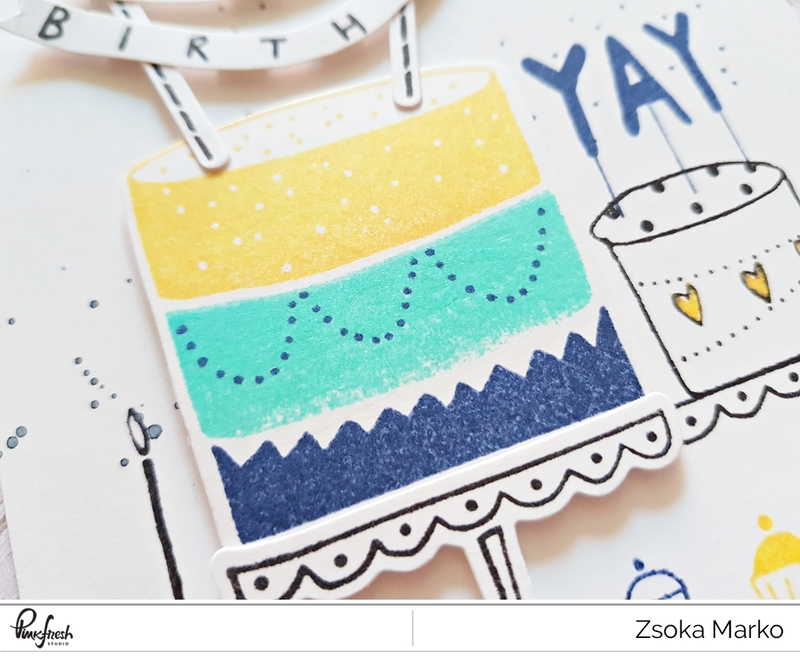 For both of these cards I've used the super fun Sweet Treats stamp and die sets. I love these sooo much! I started out by creating a top folding A2 card base to which I added an A2 size grey card stock panel. Then I cut some Neenah Solar White card stock down to a 4"x5.25" size and stamped roses on it with a very light coral ink. I die cut an oval shape for background then started stamping the rest of my images too. I die cut the cake, flowers and flags using the coordinating dies and popped them up to create dimension. To finish off my card, I glued a twine bow at the base of the cake and added some light coral Nuvo drops. Now for the second card I created back in January. I wanted to make something masculine, simple, yet fun for my boyfriend. I picked some pool color, navy and yellow inks. Some of the images I stamped directly onto my A2 size top folding card base, one I die cut and adhered to the base using foam adhesive so it stands out. To finish it off I splattered some navy ink here and there. Hope you like today's inspiration! Now for the fun part! GIVEAWAY!!! Yay! 1. Following this blog hop, you can win at each stop (you'll find the participating blogs at the end of this post)! That's right! On every single participating blog you can win awesome prizes. Here on mine you can win a $40 gift card to the Pinkfresh Studio Store! What what?! Thank you Pinkfresh Studio for your generosity! To be eligible, just leave a comment until Monday, April 9th 6am PST. All winners will be posted on the Pinkfresh Studio Blog on Monday, April 9th 12:30pm PST. Be sure to check the PFS blog that day to see if you won! 2. 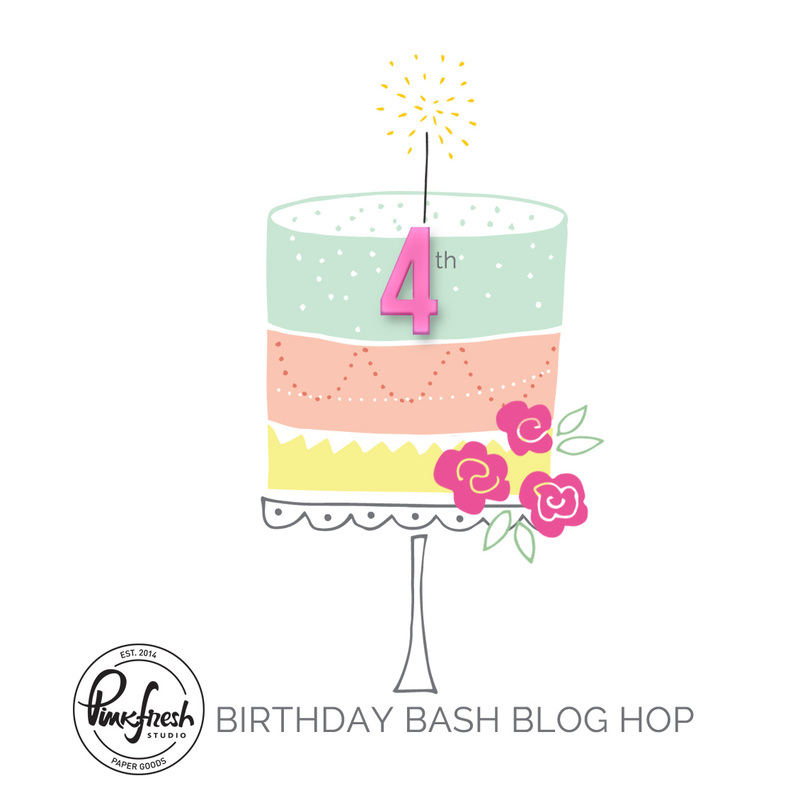 Leave a comment on the Pinkfresh Studio birthday bash blog hop post and you could win a $100 gift card to the PFS store! WOW! Rules same as above! 3. Instagram 24 Hour Stories Giveaway - One lucky winner will get a $100 gift card to the PFS Store. All you have to do is repost the Birthday Bash story. The winner will be selected within 24 hours! 4. Aaaand that's not all! There will also be a Stamp and Die bundle giveaway on the PFS Instagram feed as well. Make sure you check it out! GOOD LUCK you guys! I'm so excited!!! Thanks for stopping by and enjoy hopping! I absolutely LOVE your style. Both of your cards are fantastic!!! These cards are amazing. I especially love the first one. The rose background is so pretty. That cake is so stinkin cute. I love that you can make such variations. I love how you achieved two very different looks, super job! Love your card. Always looking for different ways to say happy birthday on cards. Thanks for sharing and have a wonderful week. Ooooh.... love the colours of your card! Both your projects are just perfect!! Your cards are very yummy ! Both cards are adorable. I am really into the peach/coral colors right now. 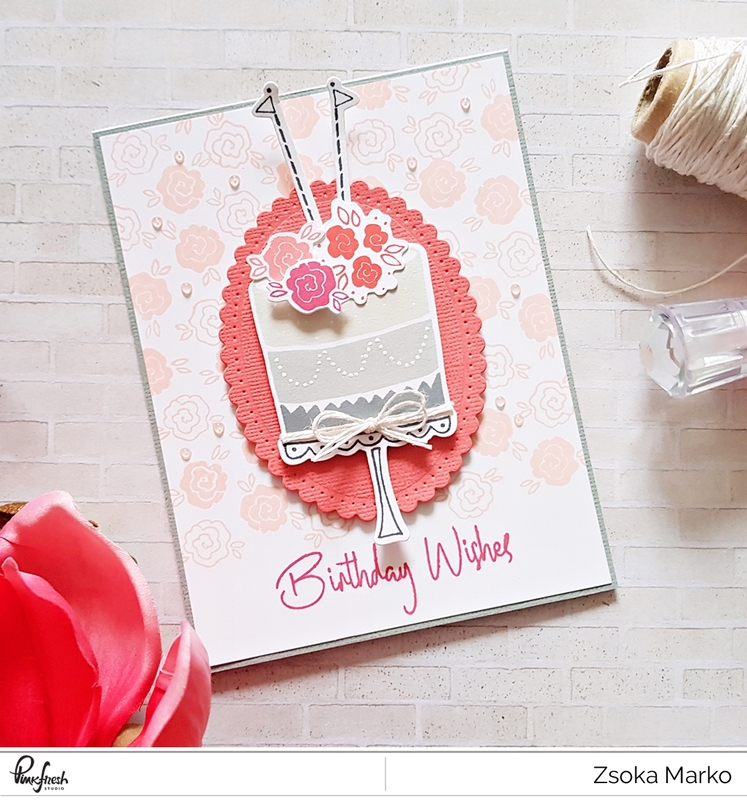 Love the soft roses background for the first card and the other cards are so inventive. You are a truly creative person. I love both of these cards, so inspired! Beautiful cards. Loved both of them. Both of your cards are great, did your boyfriend enjoy his card? He should have because it was great! I also love layering lots of mats and paper pieces on my cards. Thanks for sharing and for a chance to win in this hop. These are such fun birthday cards! Love! These birthday cards are soooooooooooo cute!! Very nice cards. I love the soft coloring on the first one. Love all of your cards as always! Take care sweetie! Both are fabulous! Love seeing how that sweet cake can be so different with just a few changes! Sweet cards! Lovely balance of elements and white space. Perfect pops of colors to provide contrast with the soft elements. Beautiful cards. My favourite is perhaps the first one, with the customer background . Both of these cards are beautiful!!!! 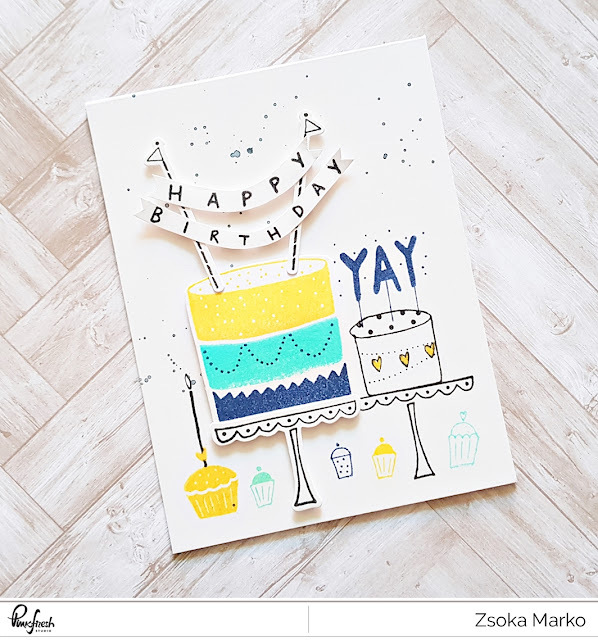 You've shared a couple of really great ideas for this fun birthday set! love the different looks you got with the same stamps! Oh wow, fun and beautiful cards! Such beautiful cards! I always love your work. Such pretty cards - love the stamps and the colors. Fabulous birthday cards! I especially love the coral and pink color combination. 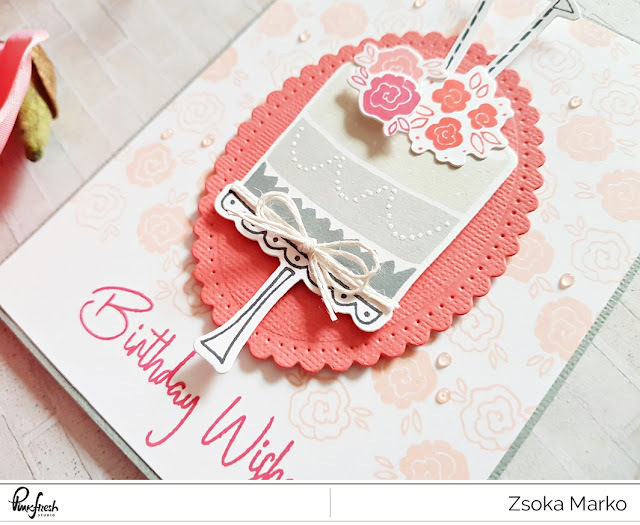 Love these cards - the soft colors on the coral cake are so pretty! Both of these are so pretty but I really love the colors on the first one! 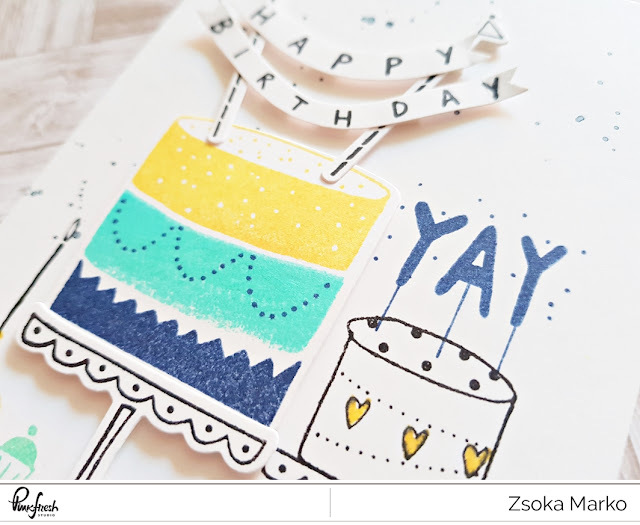 I love both of your cards, Zsoka! I love how soft and pretty your first card is and I equally love the colors you chose for your second card. They are such great birthday cards! Very pretty cards. The first is so feminine & fresh. The second would make a good masculine card, and I always need more ideas for the "guys". Fabulous cards! You've such a wonderful use of color. Love them both! Awesome cards. Really love the pink and grey. I love both cards. It's always a struggle to make masculine cards and this one is great. The first card is simply gorgeous! Love the layering and colors on these delightful cards! What a treat! Both cards are beautiful ! The pink one is elegant and the blue one is refreshing ! TFS. Wow what pretty cards! Love em! Both cards are awesome! I love how you show the versatility of this stamp set. Hermosas tarjetas me encantan lo que ha logrado con ellas son increíbles esos sellos ya quiero tenerlos!! Both of your cards are really beautiful. I’m so happy I’ve ordered that stamp Set!! Beautiful cards! I especially love the background you stamped for the first card! Great cards! I love the super cute cakes. Thanks for sharing! I loved both the versions of your cards! Precious cards for such a great 4th year celebration! TFS! 2 lovely cards. Thanks for sharing! Love your cards so much. They are so gorgeous! thanks for sharing! Wow! Love your gorgeous cards!!! Colors are amazing!!! Both of your cards are perfection. I love how you can use the same stamp set and make two cards with a totally different feel. Hoping to get my hands on this soon - I adore that wee little flower grouping. Thank you for sharing your talents! These cards are great! I struggle with masculine cards, yours is perfect! Both of your cards are perfect. Fantastic vibrant colours, love them all! Zsoka your cards are adorable, like all your works! Both are beautiful but that first one I absolutely LOVE!! Adorable birthday cards!!! Thanks for sharing!! Fantastic birthday cards! The coral one is absolutely gorgeous! The second card has such a fun, party feel to it! These are lovely. The first card made me think of a wedding cake. So beautifully done. Great birthday cards! I love the different looks you get from that cake set! Awesome idea on the first card with the background and cake image. That's just amazing and so cohesive. Thank you for the inspiration! Amazing cards!! I just love their stamps!! I love both birthday cards designs!!!! They are dainty, classy, fun, and definitely made from the heart! They are so special! Love love! Wow! 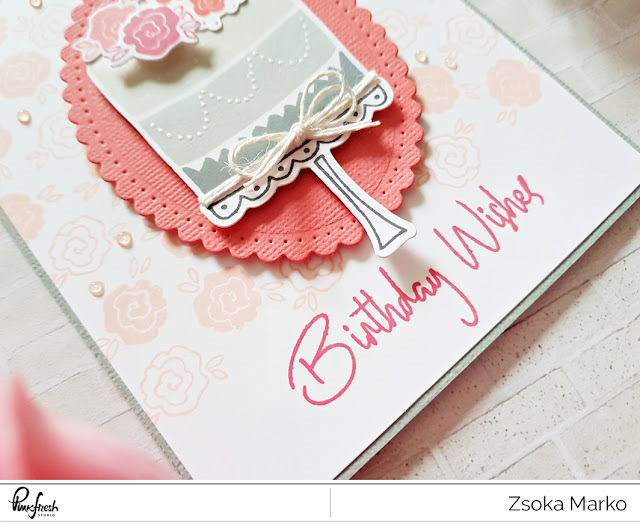 Love both your cards, great style! And I love that particular PinkFresh stamp set... well all of them! I really like how you kept such a clear color palette on each card. I have a tendency to keep adding more and more colors, so I appreciate the inspiration that keeps it CAS (color-wise). I also appreciate all the ways you used dimension and texture to help augment the simple color palette. Thank you so much for sharing your creativity with us! Zsoka, you did an amazing job on both cards. I love that the one you made for this hop is quite feminine and your boyfriends is more masculine, it really show how versatile 1 set can be and so much more! Very well done on them. Lovely and fun birthday cakes. Love both of these cards but I think the coral coloured card is my favourite. Beautiful work. Thanks for sharing. Love these sweet fun cards. Peach and gray - so beautiful and elegant! So simple and so perfect ! Thanks for sharing ! I love both cards & the color combo! So pretty! Beautiful, love the color combos! That’s a wonderful set of cards !! I love your cards!! Beautiful colors and put together so well!! LOVE! Pinkfresh Studio 4th Birthday Bash Blog Hop!! It was so soothing to the eyes. Gratitude for these lovely photos. You know we have also decided to host the first ever themed party for our son. He’s turning 7 now and has always celebrated his birthday at home. But this year we are going to throw the party at some outdoor NYC venues. Theme is not decided yet.